I'm always super nervous to try new skincare products. But, recently, I've been searching for cruelty-free and earth-friendly items to introduce into my beauty routine. When Peachy Fox London got in touch with me, I was super excited to sample some of their natural, organic and ethically-made products. Disclaimer: I did receive this product for free from Peachy Fox London, but, as always, all opinions are my own. I chose the Anti-Redness Facial Cream from their Amazon store. It promised to calm the appearance of redness and be kind to rosacea-prone skin. If I could send this back in time to my teenage self, I would. I used to suffer badly from redness on my face and it was something I was hugely self-conscious of. Nowadays, my skin and self-confidence have both changed; I still experience a little redness but it's nothing that I bother to fuss over. But, I wanted to try the cream because I've never seen a product like it. With flaxseed oil, green tea, cucumber extract, chamomile & rosehip oil, this cream really does do wonders to reduce redness. I have used this cream before bed and before applying makeup and it soaks in beautifully to the skin. 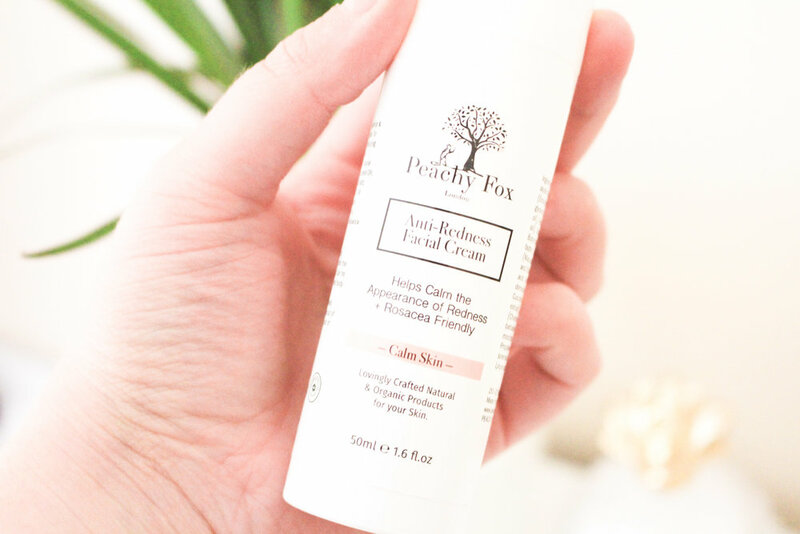 Many face creams I have tried in the past are quite heavy and sticky, but, Peachy Fox have cracked it when it comes to lightweight, yet effective skincare. All of their products are all ethically made and not tested on animals, as well as made from natural and organic ingredients. This means no parabens, sulfates, colours or Petroleum. Yay! Also, shall we just mention the packaging? I love the super clean, yet pretty design. Is it lame to say that I love the way it looks on my dressing table? Peachy Fox London has an array of other products too, suitable for all ages and skin types. I have my eye on their deep mud mask. You can see their full range on the Peachy Fox London website.